Now Crayola has the perfect solution! A super cute box of mini nail polish makes us wax nostalgic, but also provides us with some seriously colorful nail situations. Includes eight bottles in your favorite colors. Each bottle is 0.07 fl oz. Box measures 4.25"x5.75"x1.5"
Why stop at your coloring book? 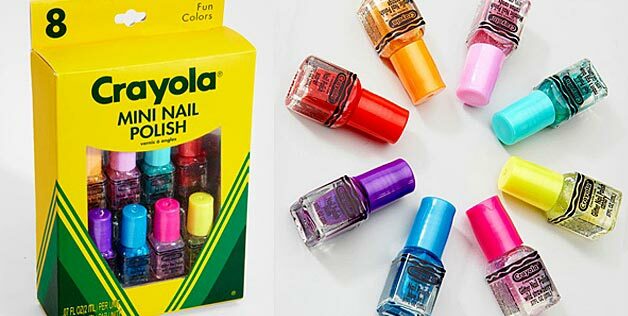 Crayola has launched eight super-bright nail polish colors. 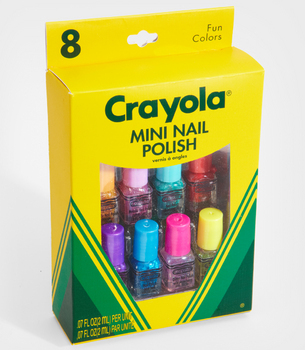 Play-time loving kids and adults can dig into a vintage Crayola box of nail colors for two bright pinks, two blues, a yellow, purple and an orange polish. The box of brights retails for $12 at FredFlare.com. FredFlare is an online e-retailer and currently does not have a brick and mortar store. However their online store is safe and secure so you can feel confident when ordering from them. This will be my second purchase from them and I haven't had a bad experience yet. Fredflare.com is an online store selling various items, including accessories, men's and women's clothing, stationery and home decor. It sells many different brand names, such as Paul Frank and Tokidoki. Named after Fred Astaire, it was created by Keith and Chris in 1998, originally selling beverage coaster off the back of a bicycle in SoHo, New York, not yet being an online store. When placing an order with them you do have the option to pick up your order. They are located at 300 Kingsland Ave, Suite F, Brooklyn NY 11222 (between Nassau Ave. and Norman Ave.). Their warehouse is open M-F 9am to 5pm EST. Or you can have your order shipped to you for a small fee. To avoid the shipping fees use code "CUTE" at checkout with your $50 order and shipping is free. I should receive my polishes in about a week, (standard ground shipping was $10) and I'll post a review with swatches then. Beauty companies are always nabbing inspiration from the past. SCORE ALLURE'S FALL BEAUTY BOX WHILE IT'S HOT!